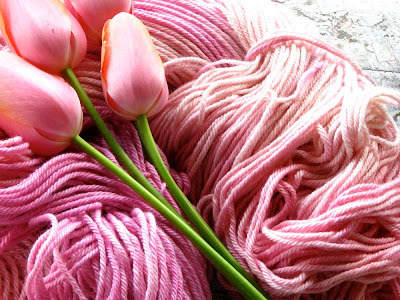 I am not normally a pink person; but I find myself dyeing and spinning lots of luscious flower inspired pinks. Spring is in the air and I am definitely on a pink roll. 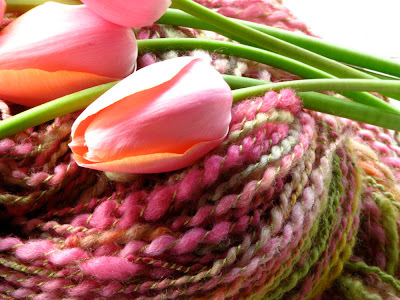 This yarn has been added to the etsy site and is named Peony. I’m on a flower roll as this and other yarns I’ve dyed recently are inspired by the May challenge of my etsyFAST team (fiber art street team) called May flowers. 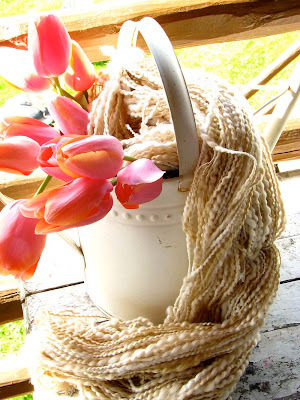 This handspun yarn called Caramel Creme made me hungry for ice cream with caramel the whole time I was spinning it. Super soft and super pink (yikes); I call this Apple Blossom. It is an organic merino from Henry’s Attic that I hand painted and also just went up on my etsy site. A couple of more pink skeins and I should have this out of my system.